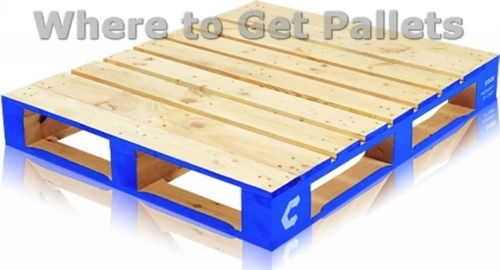 Throughout our website we have worked on countless pallet projects considering the easy availability of the pallets. But keeping in view the most trending nature of pallets we must be well prepared with the anticipation of finding it hard to arrange for so much plenty of pallets as every of our pallet project takes bunch of pallets to be recycled. When we go on internet we find the pallets to be the hot cake of the day. The idea of recycling pallets is getting so much famous with the passage of time that these ordinary objects called pallets which were always lying idle in frequent spaces have become a real deal. Because now a days people are getting much inclined towards home based pallet projects so certainly this is high time. The pallets are in huge demand graph. So before we get buckled up for our new project, we have to make sure the availability of some fine pallets. Before we go in the detailed search of raw wooden pallets, we have to bear in mind certain facts that might harm us. The moment across a huge pile of pallets, we must make sure that they are not contaminated and polluted with such a substance that might harm your skin and cause a variety of blemishes. Plus they must not be in deteriorated condition as they might lack the useful wooden planks that you might need throughout your project. So all these factors must be kept in mind before arranging the pallets. Now let’s get to the real business of the day. Our consideration for the day is how to arrange a bunch of pallets free of cost or even against minor expenses. As we discussed earlier that this pallet recycling has become a rising trend of the day so people are more and more interested to grab the pallets now days. So get ready for your share. We are going to discuss a few places which might prove to be helpful in arranging raw pallets. The business dumpsters usually the smaller ones are best in this regard. They mostly sell their waste materials against minor expenses to earn some money. They have mostly piles and piles of raw pallets which really exceed their needs so it becomes mandatory for them to get rid of these pallets. They actually lack the recycling inclination and resources so they compile them in dumpsters. Well you can make a contract with them where they become bound to supply you slowly and steadily with the minor quantities of pallets against maximum lowest costs. This can not be the scenario with the bigger business set ups as they adopt various procedures to dump their waste. So you can visit any small business firm and get the quantity and quality of pallets that you require. Usually you can find pallets lined up on racks or piled up on roads but they are not free of cost always. So you can remain in contact with the hardware stores, garden stores, lawnmower and equipment shops who normally take the responsibility to move the pallets from one place to another. So it would be better to get to that place in the early morning or in evening when you can have pallets in relatively larger quantities. They are the ones who can provide you with some quality pallets as they compile their pallets in inventory. The lumber and pallet scrap is piled up in huge stores. Construction sites are another major source for the collection of some quality pallets. The house builders and contractors have pallets in huge quantities as most hardware items are delivered in these very pallets. The house builders are normally not interested in storing the wooden pallets and they just care to dump them. So you must maintain some good relationships with such architects, from there you can find pallets with their favor free of cost or otherwise against some minor charges. All the shopping malls have plenty of pallets as the goods are delivered to them on these very pallets. So it is a mandatory stuff in every mega mall. Try to select the opening time of some mega malls. On the time of opening they are screwed up in various matters and they just wish to get rid of every additional stuff they don’t require in their racks. So you can go and ask them to provide you with the trashed pallets at your anticipated and desired rates. I am more than sure they would provide you with pallets all at once as they would be having no other choice except making some bucks against their waste material. Finally the internet is such pretty heaven where you can make all the deals you want to make. You can search anything on internet. You can surf facebook, social networking websites, search engines, blogs and other helping places where you can find several quotations of pallets and you can find the most suitable ones at your own just with a click. These are a few of the steps you can take when you are running short of pallets. But you can also find them totally free of cost lined up on the road if you are lucky enough.